Michelangelo lived a life which is described as being abstemious. Ascanio Condivi, Michelangelo’s apprentice and biographer said that Michelangelo was indifferent to food and ate “more out of necessity than of pleasure.” He was content with a little wine and bread while he worked. 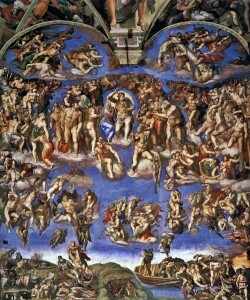 While working on The Last Judgment he waited to eat until evening when he was done painting for the day. Michelangelo was so intent on his art that he sometimes went without eating.